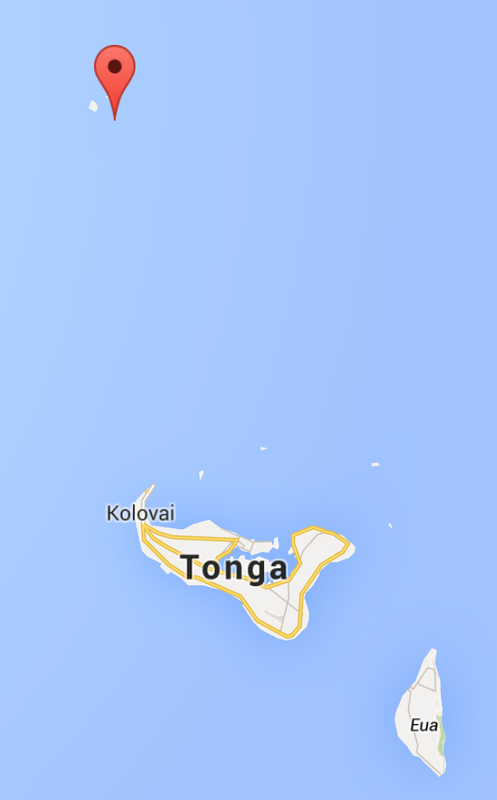 Tonga is an island nation of some 176 islands distributed over 270,000 square miles in the southern Pacific Ocean. A volcano that started spewing rocks and ash last December is creating a new island. Tonga's official island tally might soon be incremented by one. Geologists from the Tongan Ministry of Lands traveled by boat to study the volcano. They confirmed that a huge amount of volcanic material continues to transform the landscape. Tongan geologists indicated the volcano is erupting from two vents. One vent is located on the uninhabited Hunga Ha'apai (red marker, right). The other is about 100 yards offshore from Hunga Ha'apai. "The new island is more than one kilometer wide, two kilometers long and about 100 meters high"
Prior to the month-long eruption, the surface area of the Tongan islands was about 290 square miles. The surface area continues to expand. "During our observations the volcano was erupting about every five minutes to a height of about 400 meters, accompanied by some large rocks... as the ash is very wet, most is being deposited close to the vent, building up the new island." Rock and ash exploding from the Hunga Ha'apai volcano. The Tongan islands lie on a global hotspot called the Ring of Fire. 75% of the world's active and dormant volcanoes lie on the Ring of Fire where continental plates collide causing seismic rumbles and volcanic eruptions. It's here that the Pacific Plate slides under the Indo-Australian Plate. "The real difficulty about vulcanism is not to see how it can start, but how it can stop." Earthquakes and Mountains, 2nd edition (1950), 187, Sir Harold Jeffreys. Ministry of Lands, Nuku'alofa, Tongatapu, Tonga. 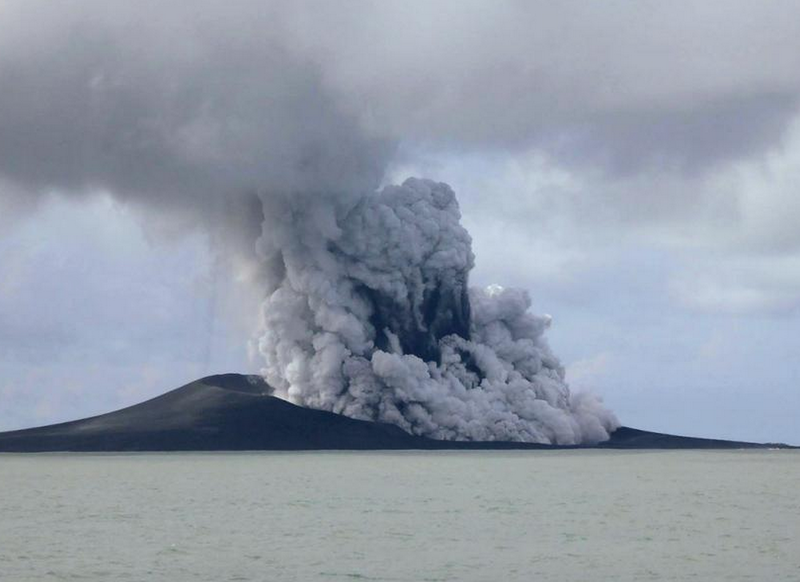 Tongan volcano creates new island, Yahoo News, 16 January 2015.